FineBack is a new brand ,specialized in the party decoration products. The foil fringe curtain absolutely is a perfect choice as many event occasions. It can be used as a backdrop for our photo booth which provided anice glow to pictures.Shiny metallic materials also are perfect for Christmas decoration, birthday party, wedding party, stage background decorations. Besides, Light weight for easy portable, simple assembly within 10 seconds and disassembly.Importantly, Equipmented with DOUBLE-SIDE-TAPE and BALLOON STICKS maintain longer duration. Even be used as the door curtain, still can hold the passing crowd. POWERFUL DOUBLE VISCOSITY Coming with DOUBLE SIDE TAPE and BALLOON STICKS greatly increase its duration . DOUBLE-SIDE-TAPE can meet to the daily need. It can last for longer than the common foil curtains by adding the balloon sticks. 15 COLS TO CHOOSE More colorful Cols are to choose. It mostly cover all the popular cols ,including purple, gold, sliver, red, green, blue, rose red, black, pink, turquoise, white, orange, champagne, rose gold. You can purchase the accordingly cols based on the party's themes. 3FTX 8FT IN SIZE 3 ft x 8ft perfect for the photo booth /party decoration/wedding or birthday party's decoration/ graduation celebrations, or any other joyous events! If you want regard it as the photo booth background, you can put them into 3 layers and can get a overall look. EASY TO SET Just peeling off the backing of tape segments and fix fringe curtain on the wall or any door entrance! 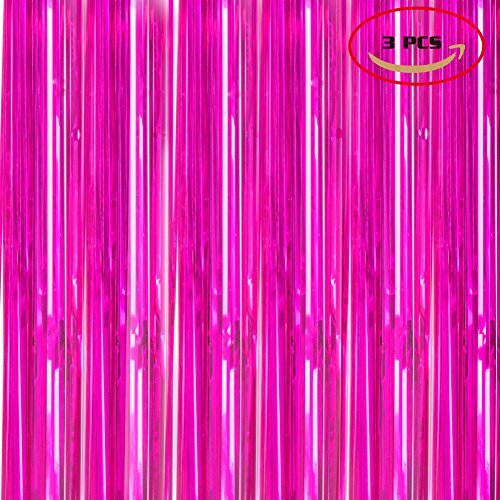 What You Get You can get the 1 piece foil curtains with 12 pieces Balloon Sticks and Double-Side-Tape, Our 30-DAY MONEY-BACK guarantee for the products defect and friendly helpful customers service. It would be a wonderful Festival Gift for your beloved ones! If you have any questions about this product by FineBack, contact us by completing and submitting the form below. If you are looking for a specif part number, please include it with your message.